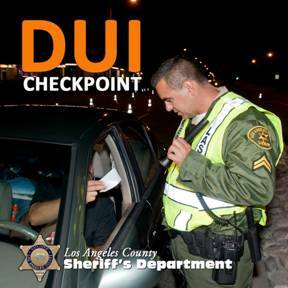 PALMDALE – The Los Angeles County Sheriff’s Department’s Traffic Services Detail will be conducting a DUI/driver’s license checkpoint at an undisclosed location in Palmdale this Friday, July 6, between the hours of 6 p.m. and 2 a.m., authorities announced. Officers will be looking for signs of alcohol and drug impairment. They also will check for proper licensing and will strive to delay motorists only momentarily. When possible, specially trained officers will be available to evaluate those suspected of drug-impaired driving, which now accounts for a growing number of impaired driving crashes. Drivers caught driving impaired can expect the impact of a DUI arrest to include jail time, fines, fees, DUI classes, and other expenses that can exceed $10,000. Funding for this operation is provided to the Los Angeles County Sheriff’s Department by a grant from the California Office of Traffic Safety through the National Highway Traffic Safety Administration. 17 comments for "DUI checkpoint planned in Palmdale this Friday"
fear not Miss Alexis; for there are those of us who will not despise you; for making your point. @Just Wondering…Just when I was about to cry, you show up with uplifting words. Bless you. Please read the California Handbook for 2018. When you fill out forms to get a drivers license, you consent to be tested for impairment, anytime. If you refuse, it will not go well for you by the DMV. That’s just the way it is in California. If anyone doesn’t want to be tested, then don’t sign the forms and get a drivers license. The supreme court of the US has deemed that even though a “sobriety checkpoint” IS a violation of constitutional rights in regards to search and seizure and due process, the violation is minor in comparison to the “public good” of removing impaired drivers from the road. The wanton use of an alleged “sobriety” checkpoint as a fundraiser through “well, as long as you are here and stopped let’s take this opportunity to enforce other laws” is not at all within the spirit of the supreme court’s decision, but is unfortunately within the letter of the law. Sorry you are wrong, and took my comment out of context. It doesn’t matter to the DMV if you are asked to submit at a checkpoint or whether you are pulled over. If you refuse to submit to a test to see if you are impaired, then there will be consequences. So don’t fill out the paperwork for a drivers license, and sign it. You can take them to court if you want. This is within the letter of the law, and the DMV or the guys at the checkpoint don’t care about the spirit of the law. Yes they can pull you over anytime and all they have to say is “I suspect you’re impaired.” The DMV and law enforcement work together. All the arguing back and forth won’t change the outcome. Take a bus if you want to constantly complain about how unfair and unconstitutional checkpoints are. They are not going away. Yep,you sign consent if you want a driver’s license. But,with over 37000 people killed by drunk drivers,seems like only a convicted drunk driver,or someone who has had multiple arrests,would be the one who complains about the check points. Each state interprets the legality of checkpoints under their state constitution. DUI checkpoints are legal in California. Checkpoints have been ruled legal in California because DUI/drugged poses a danger that outweighs the minimal intrusion of being stopped briefly without probable cause. So you, and shortfuze can have all the gut reactions you want, and continue to complain, but I just gave you the facts. Yes, they can test anytime they suspect you are under the influence, and they can take your license, issue you a 30 day temp., and you have 10 days to take it to the DMV, etc. You also have the choice to refuse, and you can suffer the consequences. Alexis, what is it in you that forces you to keep agreeing in the most disagreeable manner possible? Do you just want people to despise you even when they are agreeing with you? Why? Tim, sending love your way, and a hug. Maybe I should set up Alexis@hatemail.com. No, on second thought I’ll just keep loving the commenters that despise me. If you opt for friendly_greetings@yourchoiceofproviders I will send you an invitation to go out for coffee. I don’t hate you, so I will respond when you give me a positive email. Something that reflects your kind, caring ways. I hope you remove the hate from timshatemail@gmc.com. I’ll leave that to you. I’m not a feminist. Okay, send a way to contact you to my hatemail account. Even though it isn’t hatemail it’s convenient.